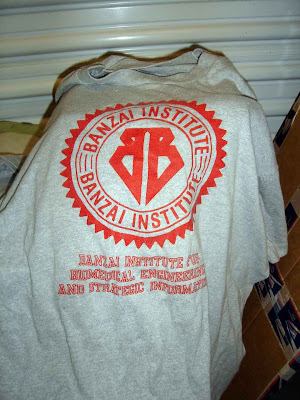 A Banzai Institute T-shirt. Vintage original 1980's rarely worn. Will Be Long Treasured. You get my point. This great ad with coupon for a "Big Barney" was listed on Ebay as such, and I bought it for ten bucks. It came, of course, attached to the whole program. Very clever listing! 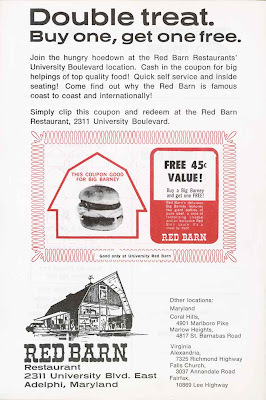 the seller knew there were more Red Barn collectors than small high school Guys and Dolls program collectors. 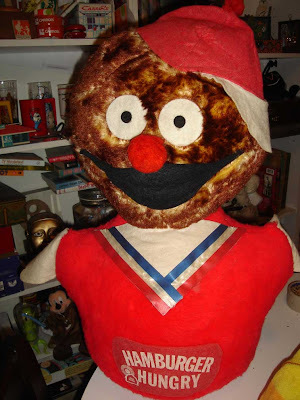 Another Red Barn collectible that I actually passed on bidding on for the longest time were the giant stuffed dolls of the "Hungries" from the early 70's. They are, to say the least, frightening. And they're huge! 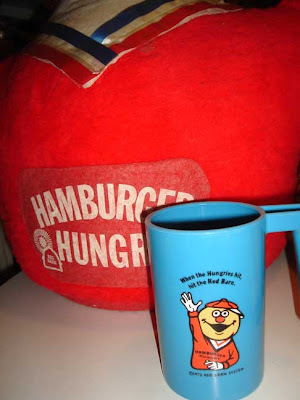 Look at how the stuffed (I say stuffed because he's definitely not "plush") Hamburger Hungry towers over the mug of the same character. He's big enough to help me drive in the carpool lane here in California. And the way his hamburger bun - shaped head translated into the odd mangy-dog looking fur...I wonder how many of these survive? I mean, how many kids really wanted these back then? Merry Christmas from Max & Alex (Zach too). I have "collected" a lot of different Christmas stuff - when they started doing great action figures based on the Rankin Bass specials, and the Peanuts Christmas Special, I got a lot of those. I also like to collect different holiday songs - I've always liked different covers of songs I like, so I like to compare The Partridge Family's "Silent Night" to Bing Crosby's, for example. One of the odder Christmas things I have - more so from an American perspective - is this Annual for the short-lived TV series "Mr. Merlin." For one full season of 22 episodes starting in 1981, I loved this odd comedy about "Zach," a teenager working at "Max Merlin's" garage, who one day pulls a crowbar out of a block of cement and proves himself to be apprentice-worthy of the great wizard Merlin who, surprise surprise, Mr. Merlin really is. Of course, being a teen in a 1980's comedy, Zach often used the magic he learned inappropriately, to pick up girls or make money - always with zany consequences. (The show had enough of an impact on me that when I saw Barnard Hughes in Tron a couple years later, I kept thinking of him as Mr. Merlin. Same when he showed up in Lost Boys even later). I distinctly remember first seeing a promo for Mr. Merlin running on a monitor at the Channel 5 booth in the Horticulture Building at the New York State Fair in August, 1981. (Their booth was right back by where they gave away the free baked potatoes, but I didn't like baked potatoes myself. The State Fair was an amazing destination in the end of summer each year, and I was lucky to live pretty close). British Annuals are a bit trickier to explain than 80s comedies, unless I have it right: basically, they seem to be books printed about a popular show, sport, or comic strip or book that are published at the end of the year, pretty much as Christmas gifts. Every one I've seen is filled with comics, games, and photos. Doctor Who has an annual each year again these days, as do many popular brands. It's interesting just to go to Amazon UK and search "annual" and see what turns up. 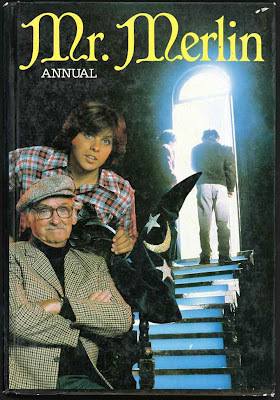 The Mr. Merlin annual includes some comics, some stories with oddly proportioned illustrations of the actors (see above) and lots of photos of the cast. Lots. I think there wasn't much to say about the little show. there is a two page spread showing the recipes to make real magic potions from the middle ages, with ingredients including parts of lions and gorillas, with the caution "please don't try these at home." Darn, I was just going to go for my mortar & pestle.... I found this Annual in a used book store here in Southern California and Had To Have It; I knew if I put it down I'd never see another copy. Merry Christmas folks. (If you don't celebrate Christmas, I hope you have a great day on December 25th of my calendar anyway, and enjoy any holidays you do observe). 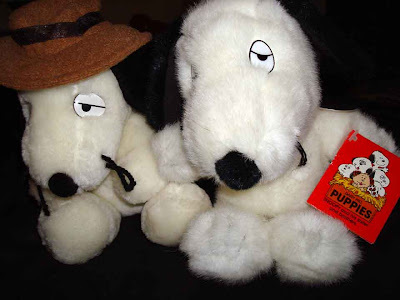 If you'd like to see something a little more "Christmassy," I recommend taking a look at Jim Fanning's recent Tulgey Wood posts: among some other great holiday things, he's posted a terrific rare Peanuts book called "Charlie Brown's Christmas Stocking" which I had never heard of. Enjoy!! I believe I've mentioned before about my decision at one point to find focus in what I collect - basically, deciding I didn't have to buy everything I stumble across just because I think it's cool. Seeing how many separate interests I have - just count the labels on this blog and know there are plenty more coming - you can understand why I want to keep an eye on branching out into new collections that, in the end, I maybe lose interest in quickly and abandon. With Focus, I recognize that I buy pretty much every Carrols item I come across (within reason price-wise), but don't buy every Indiana Jones action figure - just the ones I like. Sometimes, though, I come across something that is so cool and so cheap that I have to buy it, no matter wether or not it fits in any of my collections. The photo above is one of those things. With my recent, new-found interest in Restaurant Row and the Lobster Barrel in particular, I went one Sunday morning to the Melrose Trading Post - a swap meet at Fairfax high School in Los Angeles that is only a mile from Restaurant Row itself. I thought it was a likely place to turn up some matchbooks or other memorabilia from the restaurants, but I came up with nothing of the sort. One dealer had boxes and boxes full of photos - thousands if not hundreds of thousands - all sizes, all ages, taken, apparently, all over the world. 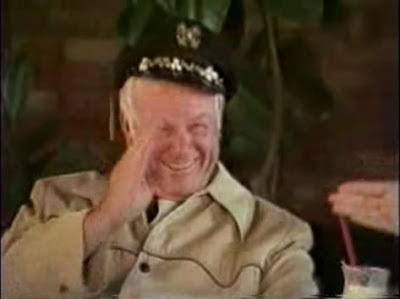 It occurred to me there may be a photo of Alan Hale with a visitor to his restaurant in there, but one of the two guys who ran it assured me there wasn't. (Apparently, he had looked at and memorized all the images?) I wasn't quite willing to dig through the bins myself, but I did spot this image on top of a bunch priced at 2 dollars apiece. there's something perfect about this photo. 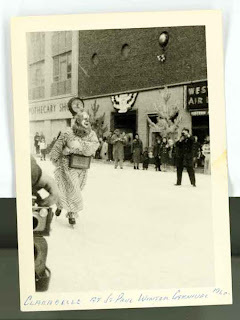 The famous Clarabelle the clown ice skating down the street, in a perfect pose. An "Apothecary Shop" in the background. I wonder about the two circles on the building up top, and the third that's filled with something. Is that building still there? From the height of the hand in the foreground, I'd guess this may have been taken by a younger photographer - and I really like that there's a photographer in the shot itself, to the right. An added observer in the image seems to make a photograph more interesting, as if it impresses on the observer a new point of view to consider. I even like the way it's labelled, in blue ball point. 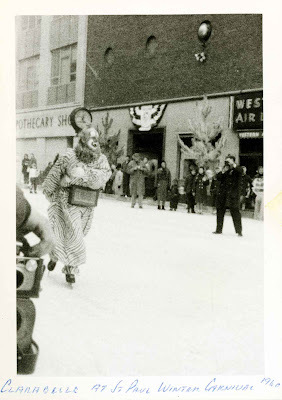 "Clarabelle at St. Paul Winter Carnival 1960." Perfect, no doubts about this image. I wonder how this ever found it's way to a folding table in a sunny southern California parking lot, almost 50 years later? 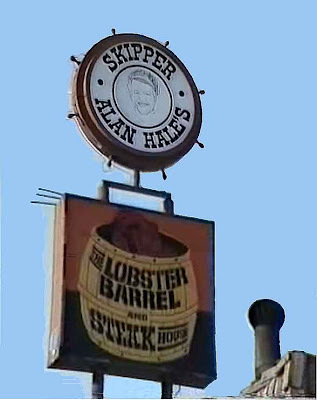 As I said last week, I've become obsessed with the history of "Restaurant Row" in Los Angeles, and especially 826 La Cienega, home of the legendary "Skipper Alan Hale's Lobster Barrel." (If you don't think it was legendary, check out the forward to Ben Stiller's "The Ecstacy and Agony," a book of Los Angeles photography, here. The Lobster Barrel comes third in his list of childhood memories of California, after "Disneyland" and "sunshine." Not bad). I quickly turned up evidence of many, many other restaurants that had occupied that location at one time. 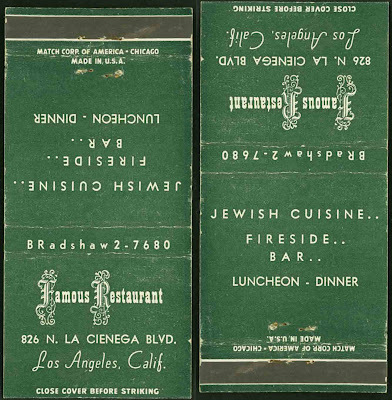 One of the first I turned up is this matchbook for "Famous Restaurant," serving Jewish Cuisine - probably the only restaurant I found in the history of the location that didn't serve shellfish. It's also, I think, the only one with a "Bradshaw" prefix on the phone number, so that may help narrow down when it was there - looks like the fifties, probably. By the way, the first time I wrote about the restaurant I got wrong what's actually in that location now. It's really "The Spanish Kitchen," which I've now visited three times. They have the best Steak fajitas I've ever had, and there are several features inside that just might date back to the "Lobster Barrel" days, like the wrought iron railings in the dining room. (check out the gallery at the Spanish Kitchen site for a look inside). More Lobster Barrel history coming at you soon! The Big Bang Theory just gets better and better. I'm really enjoying this show. If you've been reading here, you know I went to a couple of the tapings back in the first season, after the Writer's Strike was over. At sitcom tapings, the audience is usually wrangled by a stand-up comedian who keeps you entertained in the long breaks between shots, and makes sure everyone quiets down when cameras are rolling. Most importantly, he keeps up the audiences enthusiasm as the night wears on, and you have to laugh at a joke the fourth time just as if it's the first time you heard it. At Big Bang Theory, the warm-up guy was pretty good (I hate to say I don't recall his name, I'll add it if I find one of my programs). He did the exact same corny jokes both times I went, but I expect they get few repeat visitors. Anyways, both times he had scripts to hand out to some of the audience members who played along with him. I wanted one, but I didn't volunteer to sing, or play a game, so no surprise I didn't get one. The second time I went, he also had color photos signed by the whole cast. I wanted one. While I didn't get one at the show, it did occur to me that someone who got one at one of the tapings might not want to keep it, and might put it on Ebay... and I saw this picture up for auction shortly thereafter. Few bidders, it's mine. This one was actually not signed at the show, but at the San Diego Comic Con. It's identical to the ones I saw being handed out, though. 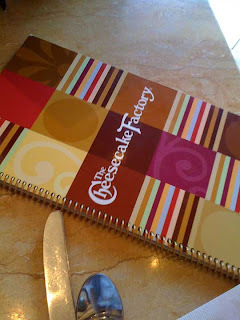 Not too long ago, I had the chance to visit one of the real-life locations often "seen" on the show: The Cheesecake Factory in Pasadena, which I'd assume is the one where "Lonely little" Penny works. I don't know why, but on the show this restaurant is always shown as being sort of plain, almost Denny's-like. In real life, they're borderline Very Fancy Looking, with that "jeans and t-shirts are okay" air that so many places in California pull off so well. I haven't tried the burger there, but Sheldon recommends it. (A note: Jim Fanning and I tend to call her "lonely little" Penny because that's sort of how she was described in the program handed out at the show. You can see that program over at Jim's excellent and personally inspirational blog here. 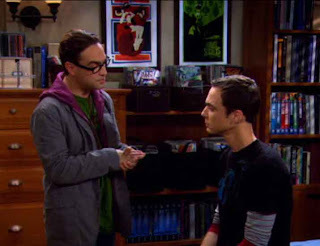 You can also read some more news on Big Bang at Jim's December 15th post here). Who'd have thunk it? I wonder how many they sold? This is one of the many collectibles I inherited when my friend Bruce passed away. I helped the family liquidate many of his collectibles, but this one was one I couldn't let go myself. 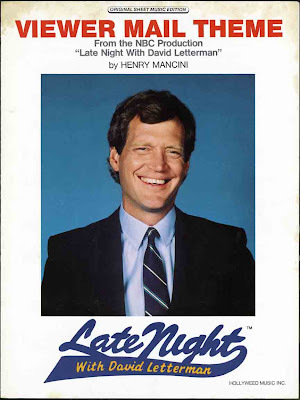 It is off my "focus" - Letterman is not something I collect - but it scores high "keep me" points for sheer "odd" factor. I've been a fan of "The Office" since first seeing the UK version. When I first heard there was going to be a U.S. version, I was certain it was as doomed as the ill-fated adaption of "Coupling" that had just recently premiered and died after only three episodes. (Sadly, the third episode was the first one shown that was all new instead of adapted from a UK episode, and it was actually not bad - but it was far too late for the show. It had gained an Ishtar/Heaven's Gate type reputation and there was no saving it. several family members I don't think have been mentioned... Vater? Mutter? Are those Dwight's parents? 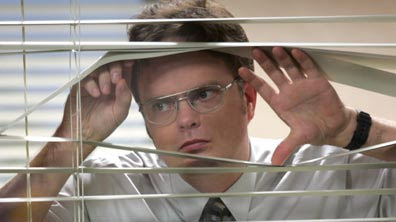 Also, note that Creed Bratton's name is in quotes, suggesting Dwight doubts that's his real name. Given what we've seen of Creed's personal life, he's probably right, but it's ironic that this is the one character whose name comes fully from the actor who plays him: Creed Bratton. 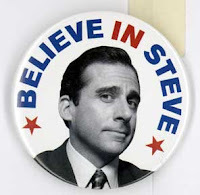 Another little item that has come my way is this Emmy-campaign button pushing Steve Carrell for best comedy performer. NBC made many of these for their different shows this year. (Sadly for Steve, Alec Baldwin's button for his performance on "30 Rock" had more sway with the Academy voting members). Not exactly a collectible but a great "fan" experience for me, though, was visiting the location where the show is filmed. Watching an episode where time is spent outside on the roof of Dunder Mifflin convinced me the building was somewhere in the San Fernando Valley. (It's the one where Michael is threatening to jump. If you freeze frame some of the views, you can see where little blotches of green where plopped over palm trees to make them look like proper Pennsylvania-type foliage). A quick Google search revealed the address and I soon dropped by. 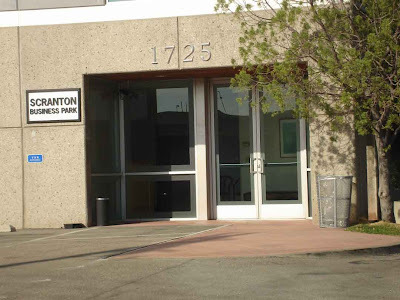 Interestingly, the outside of the soundstage where they shoot serves as the outside of the Dunder Mifflin branch, and you can drive right up and take a look at the place, and stand where Jan threw her car keys to Oscar, and see where Michael ran across the street to the train tracks. 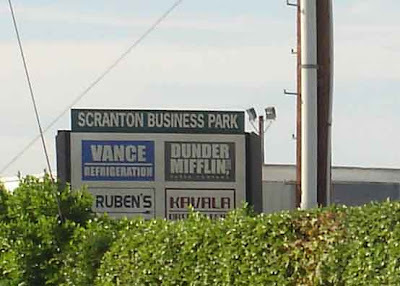 There are usually a couple of show cars parked in the lot, and you can see Michael Scott & Bob Vance's (Vance Refrigeration) parking spaces. If you get the chance to go by there yourself, please don't bother the studio. They seem to be very tolerant of polite, quiet visitors who stay on public property. I arrived once while they were actually filming outside in the parking lot - Toby's going away party from the end of last season. While the production assistant was very polite and just asked us to pull over in a spot where our car wouldn't be filmed, I left pretty quickly. I hate to be a bother/concern to people who are working. 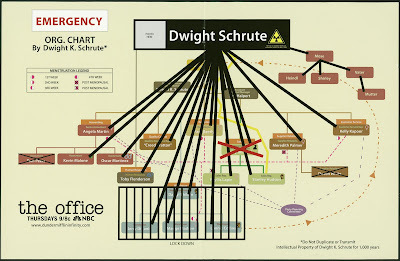 Please note: I've violated Dwight's intellectual property rights by sharing his chart here - he holds them for the next 1,000 years. If you see him, don't tell him where you saw this copy, okay? 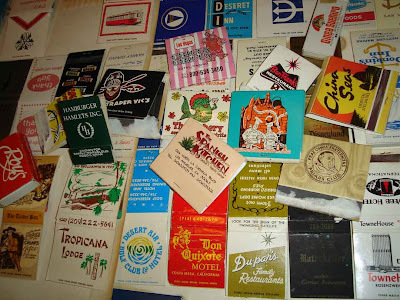 Way back on September 18th I proclaimed I was "not much of a matchbook collector." Now, three months later, I have about six hundred of them. 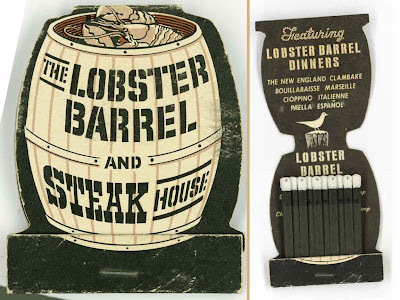 It all started because of that one matchbook I found for Alan Hale's Lobster Barrel. It proudly proclaimed it was "on Restaurant Row" in Los Angeles. It seems like, back in the 50's and 60's especially, the stretch of La Cienega Boulevard roughly between Santa Monica Blvd. 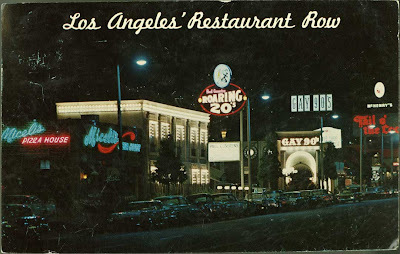 and Wilshire Blvd hosted a world-famous collection of eateries as intriguing as "The Lobster Barrel" and more. labels it "Restaurant Row," but there's not much sense of it as a collective destination that it once was. To top it off, the history of the area seems to be virtually forgotten and uncelebrated. Virtually, but not entirely. So, for the last few months, I've become a "Restaurant Row" collector - searching out information on what once was there and what still is. 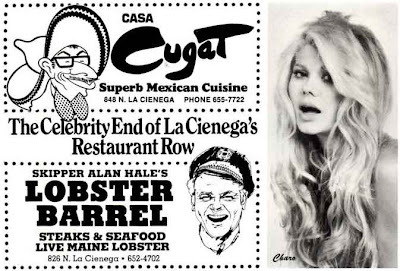 To my surprise, I quickly found out a great deal of history for Alan Hale's Lobster Barrel at 826 La Cienega. One of my first finds was this matchbook (an Ebay purchase) that seems to predate Hale's invovement in the place. Since he was so involved in promoting the place, it seems pretty clear this matchbook with no mention of the Skipper/host came from a time before the Barrel enjoyed a celebrity endorsement. Even a look at the sign out front gives the impression the "Skipper Alan Hale" topper was added after the place had been in business awhile. This image is reconstructed from a tilt shot in this interesting YouTube video that features an interview with Hale inside the Lobster Barrel itself! Quite unconsciously, over the years, I've collected a bunch of fake newspapers. Often when a new movie or TV show came out, a mock paper set in the world of the film is distributed to comic book shops and such as a cheap way to promote the film. 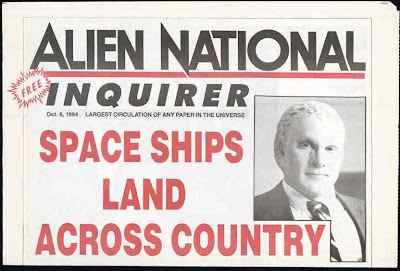 One of the more unusual ones I have is the Alien National Inquirer, which promoted the science fiction film Alien Nation (1988). Set in the slightly futuristic world of 1994, it supposed a huge space ship crashed in the Nevada Desert, instantly giving Los Angeles a new lower class of society, the "Newcomers." Very quickly, the wonder of first contact was supplanted by concerns the aliens were after our jobs and muddying our culture. Hmm. While the feature film with James Caan and Mandy Patinkin as buddy human and newcomer cops is a decent "B" sci fi film, it was really the TV series spin off - an early FOX show - that brought the concept to new levels and had the time to explore the concept. 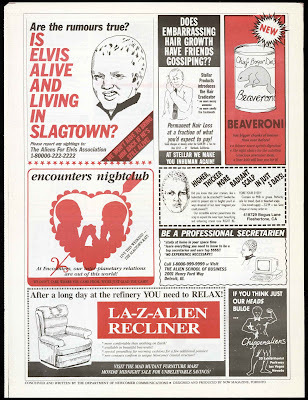 Still, this newspaper is a rare artifact of what happens when human and slag... excuse me, newcomer - cultures collide. I grew up watching Monty Python in the 1970's, during it's initial run in the US on PBS stations. I liked the show even when I didn't exactly understand the jokes. I distinctly remember seeing the preview for Monty Python and the Holy Grail at some movie I went to with my grandfather, and him laughing at one of Terry Gilliam's animated bits. (They probably shouldn't have been showing the trailer at a movie a nine year old kid would've been at, but oh well. I thought it was funny too). Several books have been released both by and about the Monty Python crew over the years, the most interesting ones to me being the early ones by them. 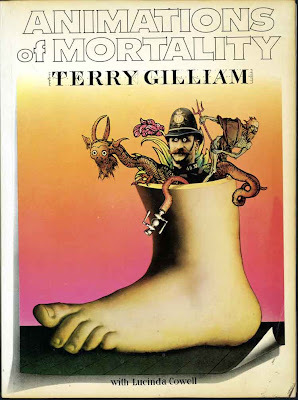 In that category falls Animations of Mortality by Terry Gilliam, released in 1978. I distinctly remember seeing this when it was released in the Economy Book Store in downtown Syracuse NY, flipping through the pages looking at the familiar animation figures he had created mostly from cutouts for the show. I never saw another copy again until I tripped across it on Ebay and snapped it up for less about cover price - a great deal since Amazon sellers now sell it for 80 dollars and up. Inside much of the book described the process of making animated films - mostly with tongue planted firmly in cheek, to say the least. 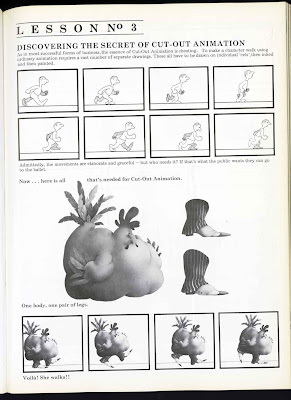 In "Animation Lesson 3" up top, Gilliam outlines the method behind the clip and assemble animation that he, well, didn't pioneer, but certainly brought to a new level of legitimacy on Monty Python. Enjoy. The Rose Bowl Flea Market is world famous as one of the largest places to buy used stuff. It's also only about 20 minutes from my home. As a collector, it's been tempting to go a few times. On my first visit, I was in the middle of my cereal fixation, and I found this nifty coloring book from 1968. 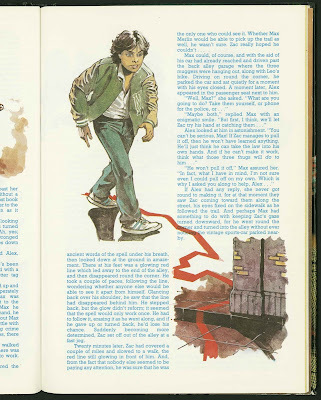 Once again the internet has made a cool connection by showing me a fellow blogger has the original art for this cover on his site here. Very nice! Well, while mine may be a run of the mill ordinary coloring book, I will point out the interior features one of a kind originals by an unknown artist, and it is Not For Sale. 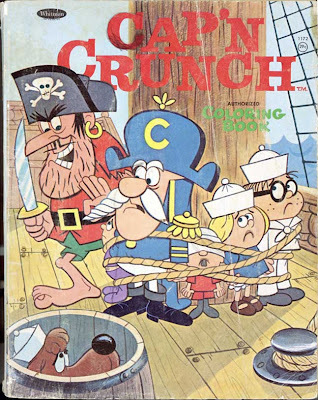 Cap'n Crunch was always a favorite because, well, probably because it was very sweet, and because the commecrcials were essentially cartoons. It's also the only cereal I can think of that makes the roof of my mouth bleed if you have it too many days in a row. I actually always liked waiting until it was on the verge of being soggy (I know, this is blasphemy, and I think the cereal company would have denied it was even possible). 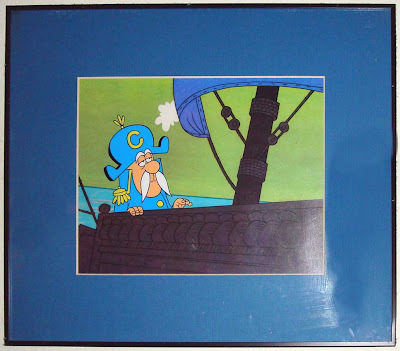 My favorite Cap'n Crunch item is this cel, below, which if I remember correctly was the second cel I ever bought. It was in a small animation art gallery on the 3rd Street Promenade in Santa Monica, and it's one of the few I paid real money for. I seem to recall I bought it to celebrate when I either got paid for a big writing job, or got a tax refund check. It hangs on the wall to the right of the Rocketeer poster, over my computer. 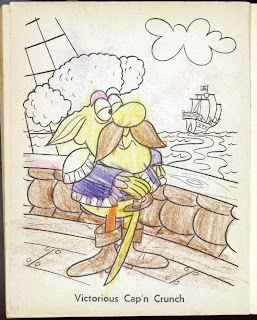 I liked it because I thought the Cap'n looked like he was nostalgically remembering his younger days at sea. A friend suggested he's waiting on the set in between takes while shooting a commercial. One year ago, one of my best friends passed away suddenly. Bruce was a lifelong collector. If he knew about something he'd like, he had to have it. And his interests were varied. As a kid, he collected movie posters. Teenager, Beatles. He became fascinated with the JFK assassination, and had probably every book published on it, including one of his own, and a complete original bound set of the Warren Commission Report. His house (above) was like a museum. He collected Disney, Monty Python, Mystery Science 3000, Titanic (The real ship and the movie), Star Trek, Marx Brothers, WC Fields, Coca Cola, McDonalds, Apple Computers, and more things than I can think of to list here. 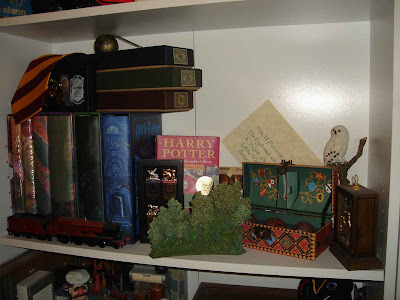 I got to know him in the last ten years or so, so I saw his interest in Harry Potter burgeon into full-blown collecting. 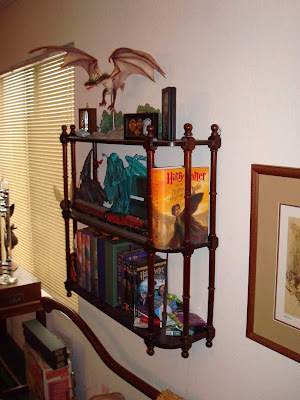 All the books, the books on CD, the prop replicas, model trains (he collected trains too). He set up a really great little display of his Potter stuff, with a full-sized broom hung by fish line underneath to look as if it was flying. He had a complete collection of Mad magazine, or so he thought. When I asked about it once, he opened the first binder and showed me issue 1, issue 2, and... an empty sleeve for issue 3. "Oh yeah, I never got 3. I forgot about that." He looked at me. "Gee, thanks. I was perfectly happy thinking I had them all, now I have to find issue 3." Within a month or so, he had it off of Ebay. After Bruce passed away, it fell upon me and others to help his family deal with all of his possessions. It was very sad to see many things that were so prized by him - as all a collectors collections are prized - now became so much less. A burden on his family, fodder for garage sales and Ebay, with, of course, treasured keepsakes scattered throughout. 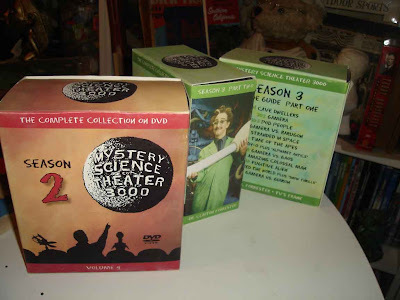 I asked for and was graciously given his Mystery Science Theater collection, because I had great memories of watching the show in his (self designed and built) home theater and howling with laughter. (if you ever get to see MST3K on a big screen, do it. The illusion that Joel or Mike and the robots are sitting in a theater with you adds to the fun). Bruce had every episode from Season Two up on tape, and was in the process of making his own box sets on DVD. I got his one of a kind sets for seasons 2 & 3 too, they will always be treasured. (The "real" Season One was only shown on local cable in the midwest; clips of it can be seen on Youtube). 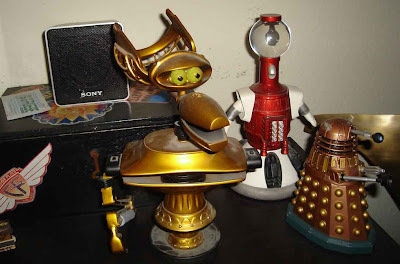 Crow and Tom Servo now sit in my living room, near my own big screen. This all got me thinking, though, about how little collectors often are prepared for the handling of their prized possessions after they pass away. If the family doesn't share the passion, they run the risk of throwing away valuable items unintentionally, or being ripped off by unscrupulous collectors. I've heard tale of a well-known collector of 20,000 Leagues Under the Sea memorabilia who, on passing away, had his collection pillaged by his most hated rivals before, as they say, the body was even cold. 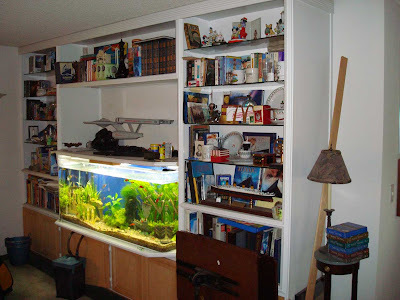 Even if the family is aware of the value of a collection, it creates extra distress - at a time when there's already plenty of distress - to try to deal with a collection in the way their loved one would have wanted, or in a way that at least gets them the fair value and moves the items on to someone else who will appreciate them. 1) Write a Will. I know this seems obvious, and may feel a little creepy, but it makes things a lot easier on your family. If you want something to go to a friend who'll appreciate it, they know. If something is so rare it should be sold at auction, they know. If you want your collection donated to an (appropriate) museum or library, they know. It can be as simple as writing it out on a sheet of paper and throwing it in your desk. 2) Label items. My Dad puts an index card in the front of his books, and with other collectibles, that tells when and how he got it, what it is, and why it's an important part of the collection. Nobody else in the world has his knowledge of Theodore Roosevelt or more so his collection, so this information is invaluable. The metal post shown here would likely have been tossed away, mistaken for an odd lighting fixture, if Bruce hadn't once just remarked to me that that pipe over in the corner of his garage was one of the original security fence posts from Forbidden Planet, set up to protect the ship from the invisible Id beast. Without that knowledge, it was trash. With it, it may fetch a couple thousand dollars at auction, restored. 3)Get rid of clutter. This one seems less obvious, but it's always good if you can take stock of what you're saving, and just get rid of stuff you really have no use for anymore. I become acutely aware of this only when taking a box to storage. Heading into the unit, it may occur to me I'm never going to come out here and dig out, say, one of these old VHS tapes to watch - so why pay to store it forever, and leave for someone I care about to throw out after I'm gone? I like to donate such stuff to Veterans or other charities, or give them to any friend I know who'll appreciate it. Well, this was a long one, but I've been wanting to put it up for awhile, and now's the time. Bruce's dying, and helping with his collections, profoundly affected how I feel about amassing materials myself. I'll have several more stories to tell relating to these experiences from now on, and more, as always. Oh, and by the way - I purchased Bruce's Harry Potter collection for a fair price. Not that I had previously wanted it before, but I didn't quite want to see it go. Now much of it is displayed on a shelf in my dining room area. Way back in April I wrote of the difficulties of collecting and saving food, and recounted having got a chocolate "Lois and Clark" trading card at the San Diego comic con back when the show was on, probably around 1993. On the way back to Los Angeles I decided to eat it rather than try to preserve it in my refrigerator for years to come. I have the Lois & Clark Chocolate Card. I've kept it in a freezer for the past 12-14 years. I've been an avid collector of all things Superman for quite awhile. I really have no idea what I'm going to do with it. Is it rare to have one still intact? You're the first person I've come across that even knows what I'm talking about. and send these two pictures of the bar today, and the box it came in. I have no idea how valuable the bar is, but I would say it's rare to still have one, and I think it makes a great odd piece for any Superman collection. You can see that chocolate doesn't hold up all that well over the years and takes on a powdery or waxy look in spots. Thanks for sharing Matt! 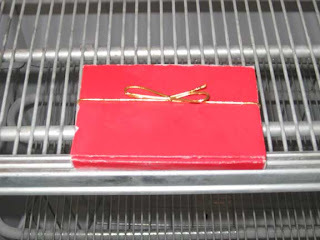 Googling around, I found this story about a 100 year old chocolate bar left on the ice by Captain Robert Scott Antarctic Expedition that sold at auction for $686 a few years back. I picture a bidding war between a chocolate collector and an Antarctic Explorer Geek. I recently received a request for an update of the progress on the Big Bang Theory / Captain Future poster reproduction project I started recently. Here it is. While it's not a really complicated job to take out the text and clean up the little tears, it does take some time, and free time is difficult to come by. I'm about halfway through the retouch job, with the price and the "First issue" text completely removed. Seems odd it wasn't sold anywhere and that the set designers actually had to make that. I just want to point out I'm only guessing that's the case. 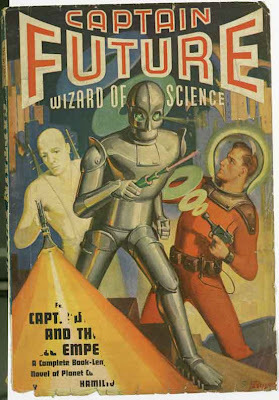 the cover of Issue one of Captain Future didn't turn up in a google search of posters, though some later ones did. But, knowing how productions and more importantly image rights work, I think they made it. It is far easier - and cheaper - to find a public domain image that fits the bill for your production than it is to secure the rights to show an existing poster. This kind of thing happens all the time. From talking with the guys at House of Secrets, I know that artist Ragnar was approached and asked if he objected to his pieces being used on the set for Sheldon's bedroom; he did not. I don't know (and it's none of my business) if they paid him to use them, but his work certainly got incredibly wide exposure being shown on Network TV. Being a cereal collector, I once in awhile buy those cereals that appealed when I was a kid - Cap'n Crunch, Lucky Charms, Trix, and especially Cocoa Krispies. A cereal collectors magazine back in the 90's (believe it or not there were at least TWO magazines for cereal collectors, Flake and Freakie Magnet) had an ongoing debate about what was the best tasting cereal: Cocoa Krispies in whole milk, or Cap'n Crunch Crunchberries in the same. It's a tough call, but the Krispies don't tear up the roof of your mouth so it's easier to get through a whole box). 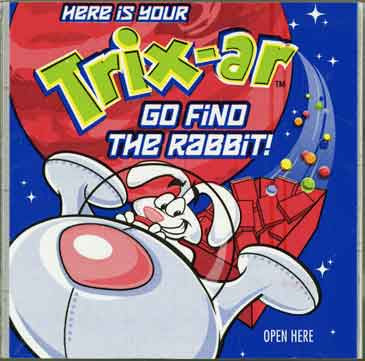 Anyways, in a box of Trix I got last year, I found this little pamphlet, sealed in plastic. I set it aside and put it in a box for storage - without even really looking at it. My point is, I had this urge to collect and save the item in the box without even taking in what it actually was, it's Just What I Do. Turns out it's a red tinted viewer for reading something off the back of the box it was in, which of course I'd thrown away. No real big deal. But - I still have the viewer, and it will always be somewhere in a box full of cereal stuff. Or, if I display them on a shelf, it's a nice flat thing to go in the back. Cool. 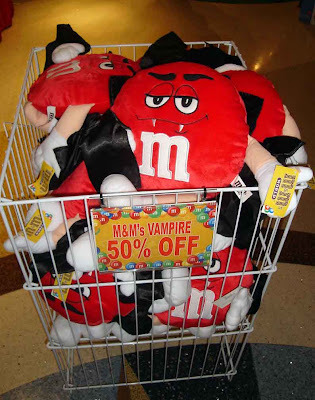 ...Don't you wish you had bought your M&M Vampire plush off-season, back when they were marked down? Now the rush is on!! In celebration of the 70's sci-fi comedy show Quark finally being released on DVD, I present one of the rarest "Quark" items still surviving, I imagine. Back in 1978, my dad's office was near the local NBC affiliate in Syracuse, WSYR-TV3. Every week, someone typed up their program schedule and they printed it in a little double fold pamphlet. 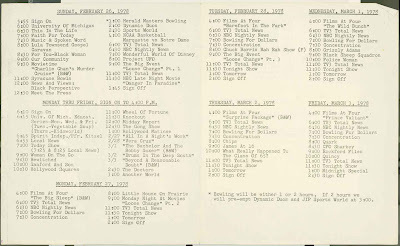 He brought home this schedule for February 26th thru March 4th, the week Quark premiered. 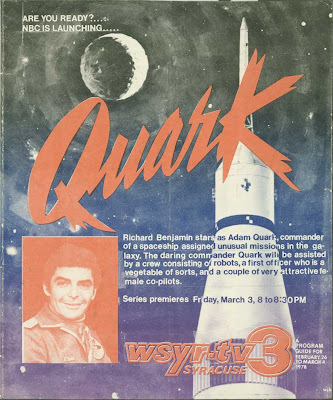 The cover is illustrated with a small publicity photo of Richard Benjamin as Captain Adam Quark, and a large piece of "file art" of what looks like an Apollo / Saturn rocket. You know, to make it all "spacey." Star Wars was still playing at the Shoppingtown Mall in Syracuse at this point (10 months after it opened - and it would be there at least another three, as I recall!) 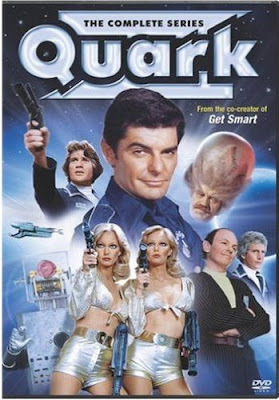 and Quark was one of the first shows to take advantage off the new craze for science fiction. It had a jump on other shows because it had already been pitched and rejected before Star Wars was released, so it was ready to go in production ASAP when all the studios scrambled to release more science fiction. 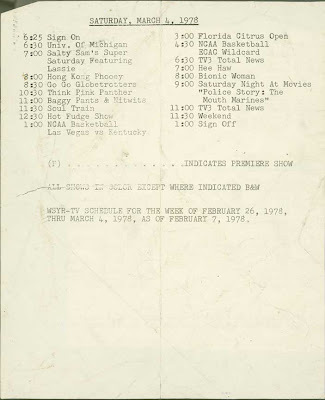 Looking at the schedule, Quark premiered on Friday night. right after Bowling For Dollars and Concentration, and right before CPO Sharkey, the Don Rickles-in-the-navy sitcom that remains permanently etched in my brain today. It's also a showcase of many other barely remembered and mostly forgotten shows: Project UFO, James at 16, and Grizzly Adams are all vague memories. But "The Chuck Barris Rah Rah Show" and "What Really Happened to the Class of 65?" are virtual blanks in my personal TV database. I strongly recommend Quark if you like clever writing, silly comedy, and cheesy special effects. It's only 15 bucks at Amazon (sorry - I mean 14.99)! The Betties and Gene/Jean will thank you. And now for something completely different, at least for me: "Chuck" premieres its second season on NBC Monday night, and I highly recommend it. Amazon Unbox had a service that allowed me to download it and watch it last week, which was terrific. I want to encourage that sort of behavior from content providers, so I'm doing my little bit to do what it's supposed to do and generate good word of mouth. Chuck is about a Buy More Nerd Herd employee (read: Best Buy Geek Squad) who gets a whole huge government database of Top Secrets downloaded into his head. He's the only copy left, and two Real Agents are assigned to protect him while he goes about his normal life, and lets them know when one of those secrets resurfaces. It disappeared after the writer's strike last year, and it's good to see it finally resurface. Catch it if you can.